What is Underground Coal Gasification (UCG)? Underground coal gasification (or in-situ coal gasification) is a controversial mining process where coal is burned under the ground to create gas. Fuels are injected into the ground to ignite the coal to a temperature of 900-1500 degrees celsius in order to produce gas. The gas is then extracted out through vertical wells or in-seam boreholes. The bores or wells must withstand extremely high pressure and temperatures, which create volatile and risky conditions. What is Leigh Creek Energy proposing? Leigh Creek Energy are proposing a new underground coal gasification project at Leigh Creek. The project would involve burning coal underground to extract gas as it comes off the burned coal. Alongside mining, Leigh Creek Energy want to see a gas-fired power station built in Leigh Creek and a gas pipeline to connect South Australia to Queensland. Underground coal gasification is an experimental mining technology with a track record of failure, polluting the air, groundwater and soil. The process of burning coal underground for gas is difficult to control and produces many byproducts which are highly toxic. The gas contains carbon monoxide, benzene, toluene and other substances that are potentially toxic or carcinogenic. Gas processing, handling and transport in pipelines poses further risks to people and the environment. After disastrous trials, underground coal gasification was banned in Queensland in 2016, and production does not occur anywhere in Australia. Underground coal gasification was also banned in Scotland in 2015. Countries that explored the potential of underground coal gasification, including China, Russia and the USA, are backing away from this dangerous form of mining. The presence of coal in South Australia’s Flinders Ranges was known and understood for hundreds of generations prior to colonial invasion in the 1800s. Yurlu’s Muda is a story of creation, spirituality, and co-existence between people and other living entities. Contemporary living was dramatically interrupted with the mining of coal. Since the 1940s non-Aboriginal people’s interests in coal in the vicinity of Leigh Creek has included public acknowledgement of the cultural significance of the area to Adnyamathanha, the Traditional Owners of the region and the First Nations peoples of the Northern Flinders Ranges area. There has never been any true recognition of sovereignty for Adnyamathanha over the Leigh Creek Coalfield however the ancient connections between land and people remain strong. People are concerned about the proposed UCG plans from a cultural heritage perspective and from an environmental perspective: the two go hand in hand. What is happening with the Leigh Creek Energy project? Leigh Creek Energy estimates there are 377 million tonnes of gas in the area. They plan to use some existing infrastructure from the closed coal mine. They have multiple gas exploration licenses in the area but do not yet have production licenses. They plan to build a demonstration plant in 2016, and have full production in 2019. The company is currently raising money by selling over $10 million in shares and and taking representatives of the company Shanghai Electric to visit Leigh Creek. What went wrong with UCG in Queensland? In south-east Queensland near Chinchilla, Linc Energy ran an underground coal gasification project involving the trial of five different gasification operations. In one 3-year test period Linc burned approximately 35,000 tonnes of coal into gas, that was mostly flared (ie. the gas was burned at the surface and not used). 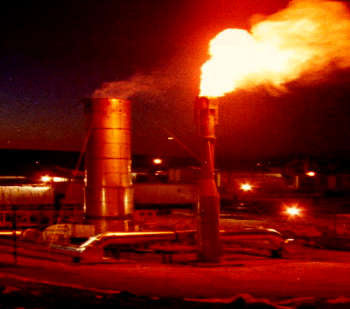 Linc Energy also own what it says is the only commercial underground coal gasification plant in the world, the Yerostigaz facility in Uzbekistan. Linc Energy used too much pressure in its injection bores which cracked the land above the seam, causing gas and other contaminants to leak out. Gas, liquid and solid waste were all released into the environment creating severe pollution. It has caused permanent acidification of hundreds of square kilometres of important farming land, high concentration of hydrogen in the soil at explosive levels and abnormal amounts of methane. The Queensland government investigation was the “largest and most protracted” in history with more than 100 investigators working on the case. It found the project “caused a degree of contamination is widespread, of high impacts and, in part, irreversible” and complaints from Linc Energy workers were “consistent with exposure to the known chemical constituents of syngas”. Government investigators at the site complained of sustained nausea, headaches, nosebleeds and tests showed high levels of carbon monoxide in their blood. High levels of cancer-causing benzene were detected at the site and nearby properties afterwards, and the government could not rule out an ongoing underground coal fire. The Queensland government launched a criminal prosecution of Linc Energy for “gross interference” to the health of workers and “serious environmental harm”, which could result in fines of up to $32.5 million. But Linc Energy is in bankruptcy, leaving the Queensland State Government with a potential clean up bill of at least $100 million. The government imposed an “excavation exclusion zone” on 314 square kilometres around the project, meaning landholders are banned from digging deeper than two metres. Queensland Environment Minister Steven Miles said the “potential risks to Queensland’s environment and our valuable agricultural industries far outweigh any potential economic benefits”, introduced an immediate ban across Queensland, and passed the Chain of Responsibility Bill through Parliament. What does this mean for South Australia? Underground coal gasification is an unproven and extremely risky technology with major threats to human and environmental health. While there are some differences between South Australian brown coal and Queensland black coal, any process of burning coal underground to create gas is risky. After three failed pilot projects and contamination in Queensland, the government brought in a ban. South Australia should move to immediately ban underground coal gasification for the safety of workers and the protection of the environment. The bond for any unconventional gas projects should reflect the risk of serious environmental damage. The South Australian Labor Party’s just transitions policy gives “highest priority to transitioning workers and communities affected by closures and reduced job opportunities in carbon-intensive industries”. The State Government will soon grant funds for the town’s economic future and must invest in safe and sustainable industries to create good jobs and support a clean economy.